Home Recipes Breakfast Pancake in the Instant Pot - Really? The Instant Pot is utilized in a slightly different way to cook a pancake. It does not ever come up to pressure...mostly because it has no liquid added to the pot. I was very worried that the pancake would burn badly on the bottom, especially because you cook it for 45 minutes!!! What? Yes, you read that right - 45 minutes! Why on earth would you do that? 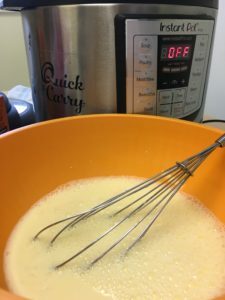 For exactly the reason that you use the IP for other recipes - you pour the batter into the pot, set it to sealing and 45 minutes, and then walk away. Go cross-country skiing. Go check on a neighbor. Take a little nap. Then have a great breakfast! Liberally spray the liner of your electric pressure cooker with non-stick spray. Beat the eggs first, and then add all ingredients to make a batter. Pour into the Instant Pot, and set the toggle to sealing and select manual/pressure cook for 45 minutes. Beat the eggs first, and then add all ingredients to make a batter. Pour into the Instant Pot, and set the toggle to sealing and select manual/pressure cook for 45 minutes. Let the IP natural pressure release for 5 minutes and then release the remaining steam. Using a spatula, turn the pancake out onto a large plate. Serve with butter and maple syrup! I love my Instant Pot – way more than I thought I would. I use it as a tool in my kitchen, and have found it to be a wonderful and handy addition to my limited counter space. A pancake in the IP is actually easy and so delicious that I will happily eat my words along with the butter and syrup slathered puffy cake. I do not believe, however, that it is the correct tool for everything you want to make. Ribs? Sure. Lasagna? Ok, whatever. Soups and stews and spaghetti and even steel cut oats for breakfast…fine. I was wrong. Really wrong! I own it! A pancake in the IP is actually easy and so delicious that I will happily eat my words along with the butter and syrup slathered puffy cake. The Instant Pot is utilized in a slightly different way to cook a pancake. It does not ever come up to pressure…mostly because it has no liquid added to the pot. I was very worried that the pancake would burn badly on the bottom, especially because you cook it for 45 minutes!!! What? Yes, you read that right – 45 minutes! Why on earth would you do that? 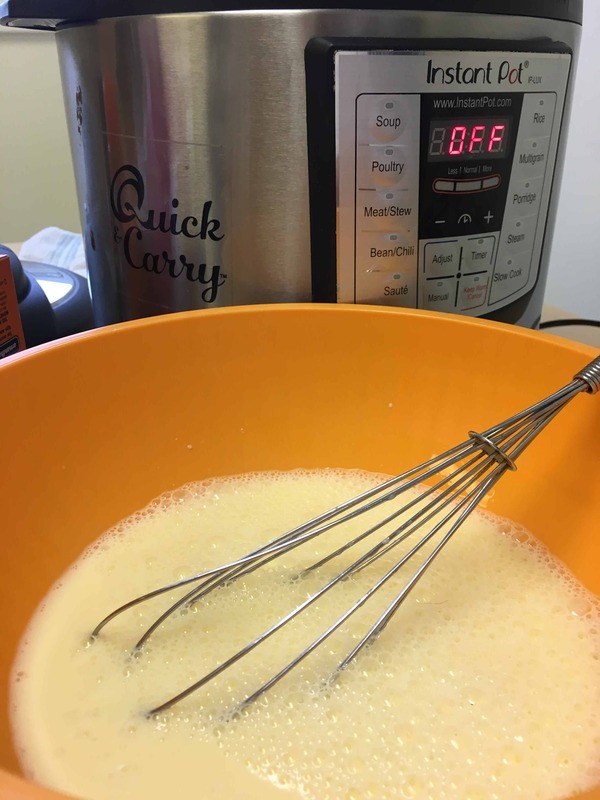 For exactly the reason that you use the IP for other recipes – you pour the batter into the pot, set it to sealing and 45 minutes, and then walk away. Go cross-country skiing. Go check on a neighbor. Take a little nap. Then have a great breakfast! 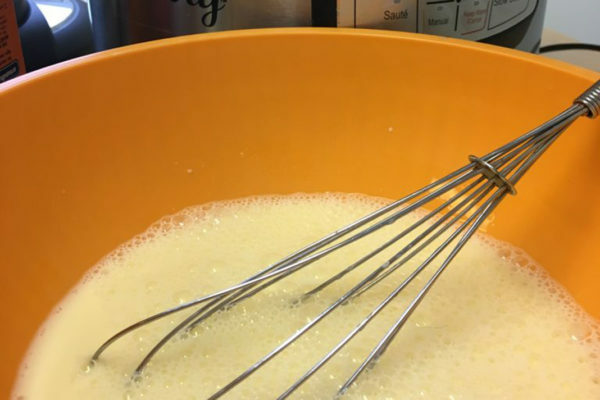 Start like this: make a batter – your favorite family recipe or the one I used, from Delish.com. I think any of them will do, but this was really tasty. Prepare your pan! Spray, spray, spray – I was very liberal with my non-stick spray, even up the sides of the IP liner. You want the pancake to be able to be lifted out, or to fall out, with gentle prodding, onto a large plate when you are ready. The pancake literally is a cake…it is quite thick and has a quasi-cake-like feel to it. Pour the batter into the liner of your cooker, set the timer for 45 minutes, make sure your toggle is set to sealing. Then, you wait. Yes, 45 minutes is a long time. Like I said before – go do something fun! Go back to bed! Read a book or check your email! When it is done, you have a huge pancake. I am serious – it is HUGE! Here in the Quick and Carry Kitchen, our expert taste testers were liberal with both their butter and their real maple syrup, and every single one of them commented on how delicious the pancake was. I agree…it was way easier, and way tastier, than I would have ever imagined.